I love going to field trips. It brings back the good old memories of my school days where the whole class would take a day off to visit and explore a certain place, get to have first-hand experience, and even enjoy a bus ride with your classmates. 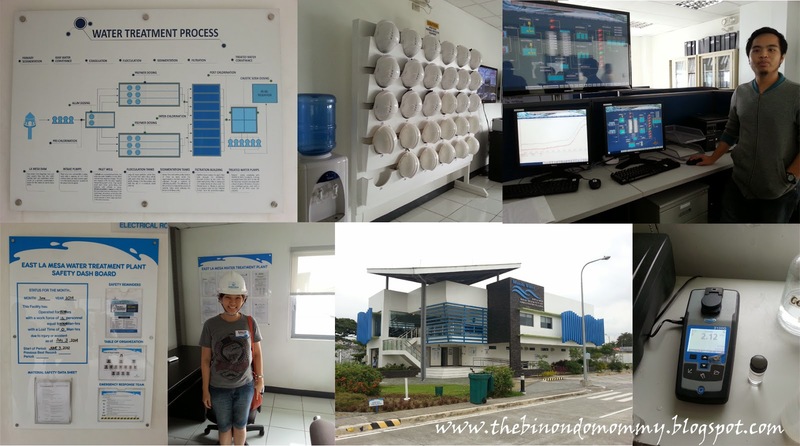 And that's exactly how I felt last July 4, 2014 (Friday) when I, together with other mommy bloggers, visited the Manila Water plant, also known as the Lakbayan. We were told to assemble at Cafe Via Mare in GT-Toyota, UP Diliman by 10 a.m. and were treated with a sumptuous lunch. After signing the waiver, we boarded their 24-seater Manila Water Coaster going to the Lakbayan Center and that's where our journey began. This is their Lakbayan Center. Cool, they have their own coaster. The tour started out with a presentation to give us an overview on what Manila Water is all about and what to expect in the Lakbayan. As you can see in my photos, everything was in blue and green, even the chairs. 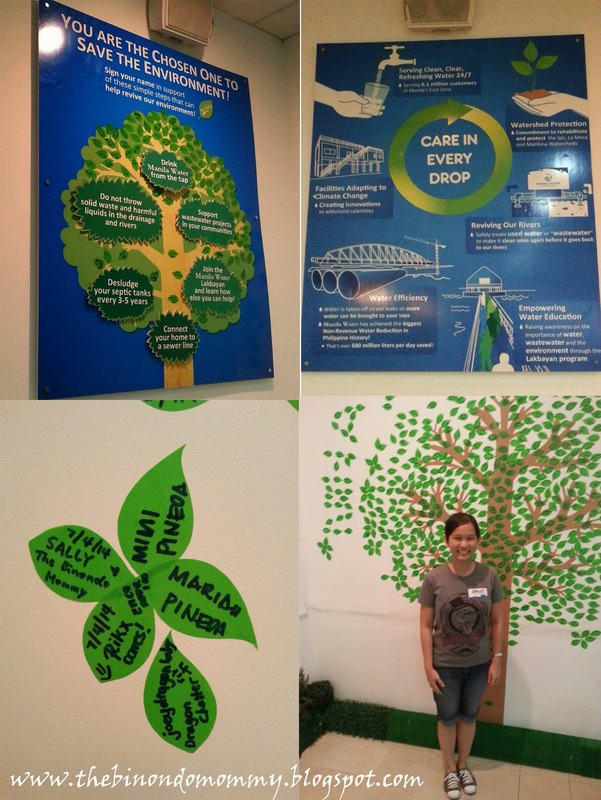 The tree-designed wall papers on the left and right are individual leaf stickers signed and "planted" by people who have already participated in their Lakbayan tour. They call it the seed of learning. Here's our seeds of learning. Our names signed on the leaves and attached on the wall. So what is Manila Water? Metropolitan Waterworks and Sewerage System (MWSS) formerly known as NAWASA, the government agency in charge of water privatization in Metro Manila, has assigned the water concession in 1997 to two companies, Manila Water for the east zone and Maynilad for the west zone. 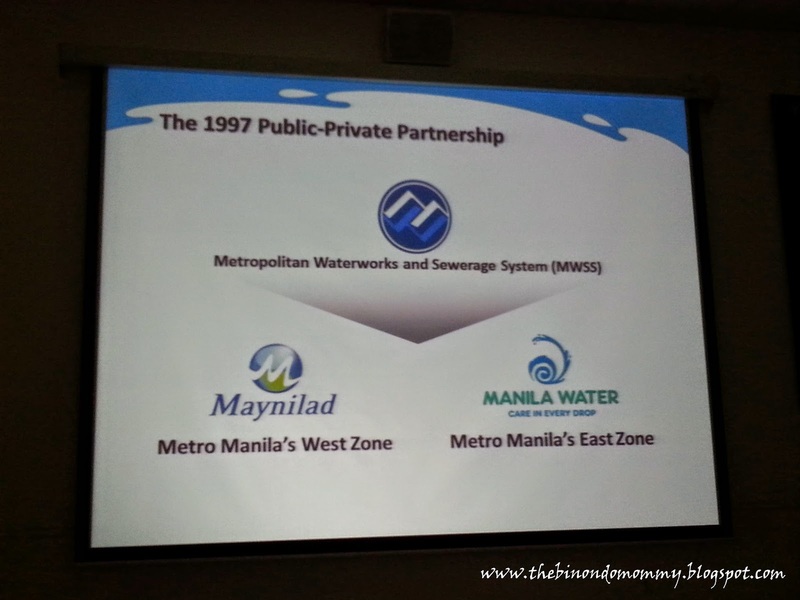 A visual presentation of the Public-Private Partnership formed in 1997. Being the east concessionaire of MWSS, Manila Water takes charge in providing water and used water services to more than 6.3 million residents of some parts of Quezon City and Manila, Marikina, Pasig, San Juan, Mandaluyong, Pateros, Makati, Taguig and Rizal Province. And from there, I now understood that there are two companies who are servicing Metro Manila's water supply and that we, here in Binondo, are under Maynilad. But despite that, I'm still eager to understand where the water supply came from and how the sewerage system is being treated in general. How does water reach the consumers? From Angat Dam in Bulacan, Metro Manila's main water source which generates hydroelectric power and irrigates rice lands, water flows down to Ipo Dam then passes through La Mesa Dam, a reservoir in Quezon City that acts as a primary settling basin, removing some of the particles that makes water hazy or turbid. Water collected in the La Mesa Dam is then treated either at the Balara Treatment Plant or at the East La Mesa Treatment Plant to undergo further cleaning using several treatment processes before making its way to household faucets. Here's a flowchart on where water comes from and how it reaches the consumers. 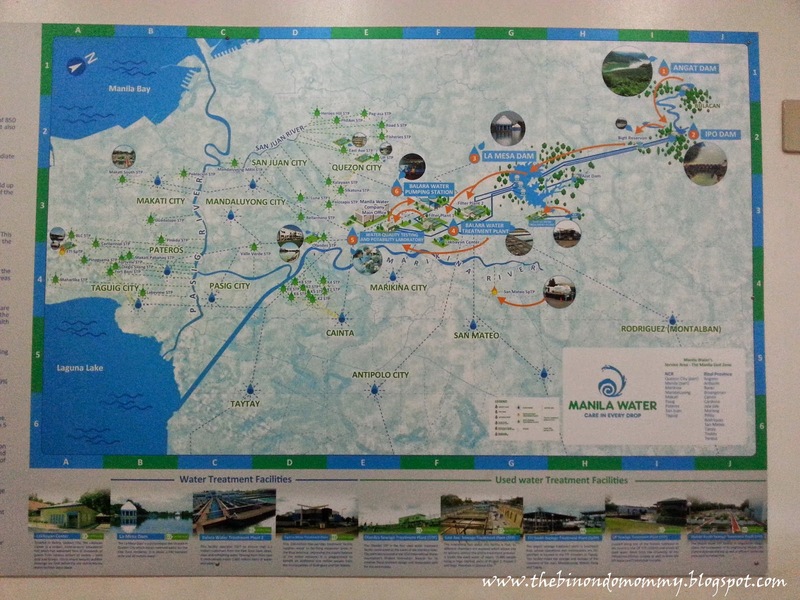 Here's a visual representation on how water flows from the Angat Dam down to Manila Water's area of responsibility and where the 36 Sewerage Treatment Plants (STP) are located. And to better visualize how water from La Mesa Dam is being treated, they brought us to their East La Mesa Treatment Plant for a short lecture and site visit to see the actual filtration, chlorination and other treatment processes. As part of their safety and security measures, we were asked to wear a hard hat at the actual plant facility and that taking of photos were strictly prohibited. And the reason why we were told to wear closed shoes is because the bridge-like walkway has grills that makes it impossible to walk when you are on heels or slippers. To describe what we have seen, at the first stop the water looks dirty and has lots mosquitoes around but they said that it's normal. Then upon entering a covered filtration, we could smell the strong scent of chlorine which they use to disinfect. 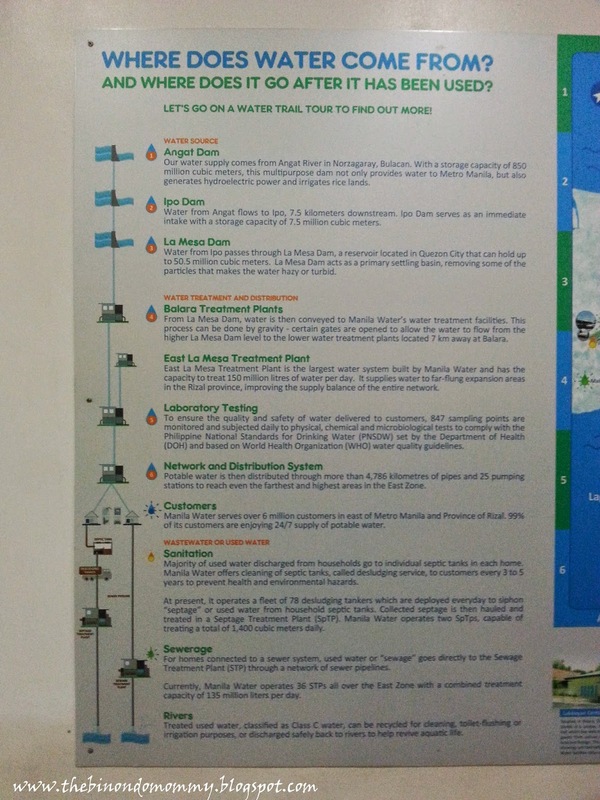 Photo credit: Manila Water's TAP Secrets pdf file. One more thing I discovered and got fascinated here is that they have an instrument called turbidimeter which they use to measure the pureness of the water. It's on the lower right side of my photo below. You pour a sample of water into the glass container with lid and place it inside the device. According to them, the turbidity of drinking water should be at least below 5 NTU, and 0 NTU to be considered distilled. This means that the lower the NTU number, the purer the water is. To better appreciate this, I poured a water sample from my water jug to see how clean our filtered water at home is. The result? 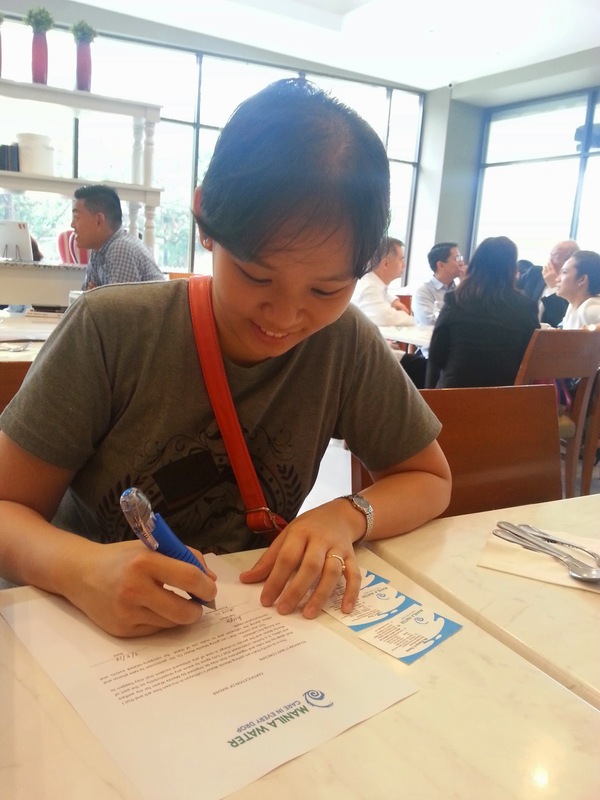 It's 2.47 NTU, good thing it got a passing mark! Manila Water's water is 1.05 NTU and their passing rate is below 1.5 NTU. To ensure that the treated water is potable and safe to drink, 847 sampling points are monitored and subjected daily to physical, chemical and microbiological tests, making sure that they comply with the stringent parameters of the Philippine National Standards for Drinking Water (PNSDW) set by the Department of Health (DOH) and based on World Health Organization (WHO) water quality guidelines. Because of this, 99% of its customers are enjoying 24/7 supply of potable water. Meaning, they can already drink directly from the faucet or tap water without the fear of getting diarrhea. Let me show you some snapshots inside their Laboratory Services. Unlike any other usual office setup, their rooms are surrounded by transparent mirror walls to ensure maximum safety and security such that everybody can easily see through all the rooms for any unusual activity or any unauthorized access inside their laboratory facility. Also in every scientific room, they have a laboratory shower, the orange nozzle hanging by the ceiling, for emergency purposes in case of chemical spills or fire burns. Not only do they test their treated water but any Manila Water customer may bring a sample of their water to the laboratory for testing. At the Manila Water Laboratory Services. And in order to measure the volume of water consumed or used by a certain household, a water meter is used. In this metrology facility, they showed us how they test their water meters before dispatching and installing to each household. They do random testing by batch and if there's a number of defective water meters, that whole batch will be returned to the supplier. That's how strict they are in terms of accuracy and reliability with their water meters. What's interesting here is that they taught us how to read the water meter. Consumers can also request for their water meters to be tested. 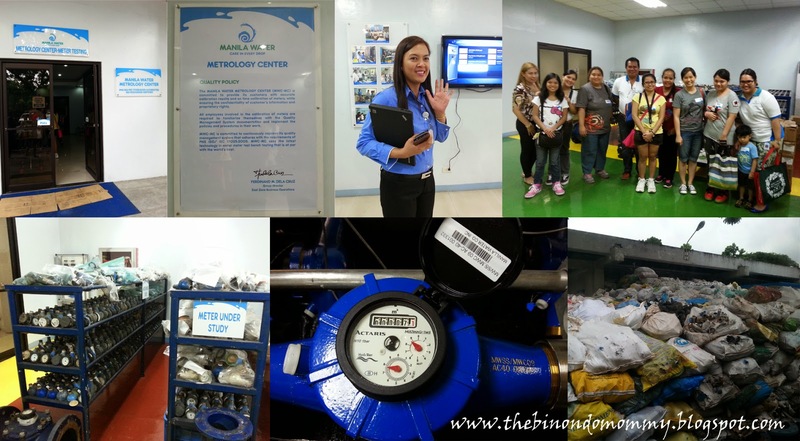 At the Manila Water Metrology Center. The role of Manila Water does not end here. Have you ever wondered where the flushed water and used water from our daily usage flows to? It goes to our septic tanks and some actually flows directly to the river thus becoming polluted. 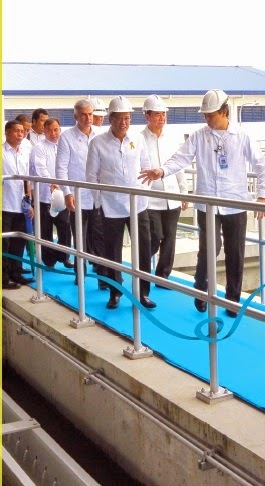 Thankfully, Manila Water came to help revive our major rivers particularly in Marikina, San Juan and Pasig Rivers. They had set up at least 36 sewage treatment plants to treat used water from households. To completely understand the whole flow of water down to treating even the used water, our last stop was the UP Sewage Treatment Plant. Again, we wore a hard hat and were not allowed to take pictures while trekking their plant site. This was the most disgusting but very educational part of the tour. We saw the actual raw sludge or poop-like residues collected from household wastes that emitted a foul smelling odor. Then we saw how they separated the liquid from the semi-solid particles, to be aerated, treated and finally discharged back to their man-made lagoon or river as Class C Effluent water. Although not safe for human consumption but clean enough to sustain aquatic life. Wow, at least now I know that our used water still has its use after being treated. At the UP Sewage Treatment Plant. Treated waste water can be used to grow plants and raise aquatic animals. After having learned this last and very noble process, I can envision having a clear-flowing and waste-free rivers in our city in the years to come. They even launched an environmental movement called Toka Toka last 2012 advocating on proper waste water management in the hopes of bringing back life to our rivers and waterways. 1. Proper waste management and practice trash segregation. 2. Take part in clean-up drives, plant tours and other educational sessions. 3. Connecting residences to sewer lines to allow used water to be treated. 4. Regular cleaning of septic tanks by scheduling a desludging every 3-5 years. Contact Manila Water Company Inc.
Lastly, should you need any of Manila Water's services such as water and used water concerns, they can easily be reached through a call or online chat. Follow them for water tips, trivia, live updates on service advisories, dam levels and other pertinent news that may affect our daily activities. For faster communication, you can tweet them 24/7. That's customer service at its finest! 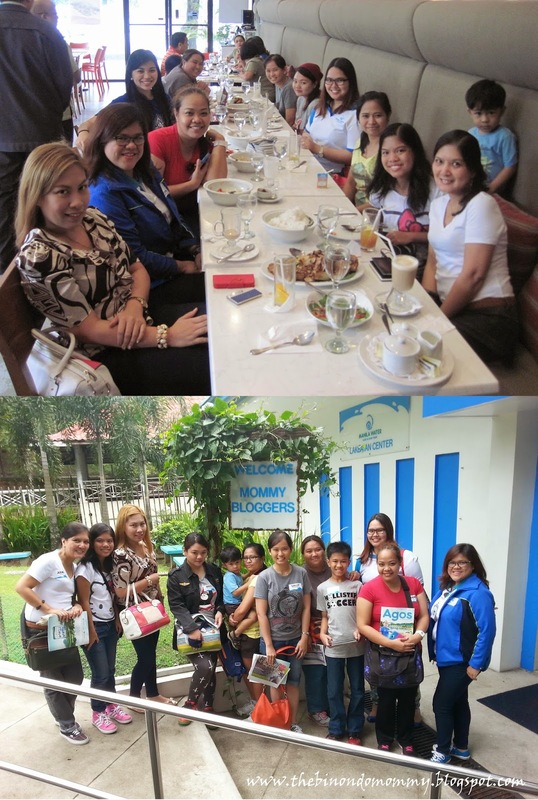 Group picture of the 6 mommy bloggers with our Manila Water friends. 1. I finally got to know the different water dams that bring an impact to our water source. 2. I am now aware of the distinction between Manila Water and Maynilad. 3. I somehow learned how to read a water meter. 4. It was my first time to enter a real laboratory facility. 5. I would take extra care not to throw any foreign object in the toilet bowl because it will be more difficult for them to treat used water. 6. I'm happy to know that our used water can still be recycled to raise aquatic animals and that our rivers still has a chance of reviving. Before our Lakbayan tour comes to an end, we were each awarded a certificate with a few tokens for us, mommy bloggers. The tour was quite exhaustive but because Manila Water knows how to take good care of their visitors just like how they show their care in every drop, we were again treated with a farewell snack, two giant Yellow Cab pizzas, which were gone in just a few minutes. Lakbayan is one eye-opener and information-packed field trip. No amount of literature can educate us better than an actual tour. With this, I promise to be careful in the best way I can everytime I am using our precious water because water gives life. I'm a certified Lakbayan tourist. Thanks for the tokens! 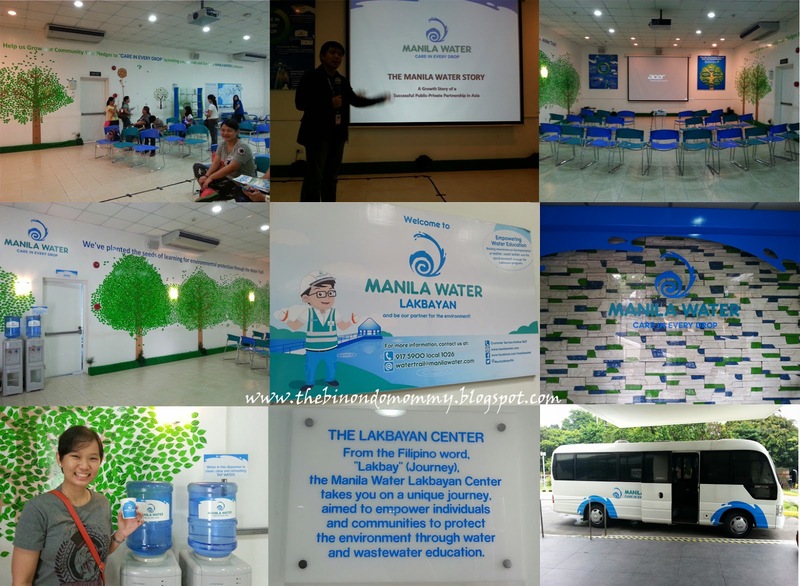 Want to experience Manila Water's Lakbayan too? 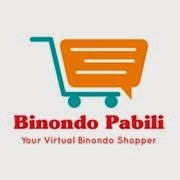 Sign up here for free. Don't forget to get a copy of their Agos magazine which contains lots of reader-friendly infographics showing how and why we must value our Water. 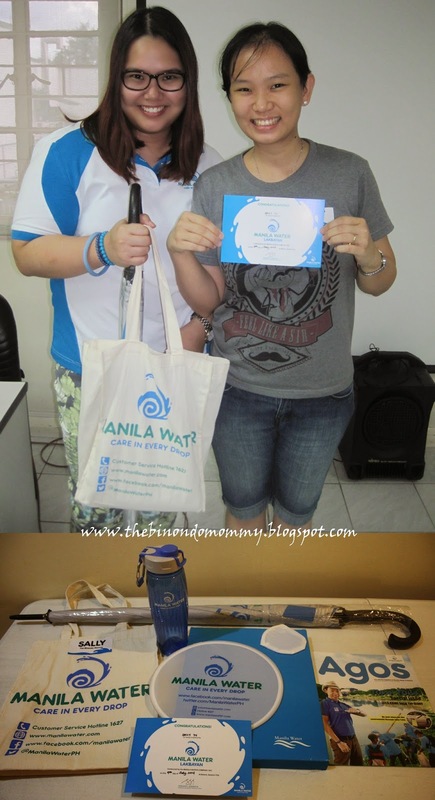 Thanks to Mommy Bloggers Philippines for this opportunity and to Manila Water for this unique Lakbayan experience. Take a peek inside their coaster. They even let us watch a short film about Manila Water. I invite you to watch this not-so-short but very dramatic story on how Manila Water touched the lives of people by making potable water readily available to the community. Did you enjoy my Manila Water post? 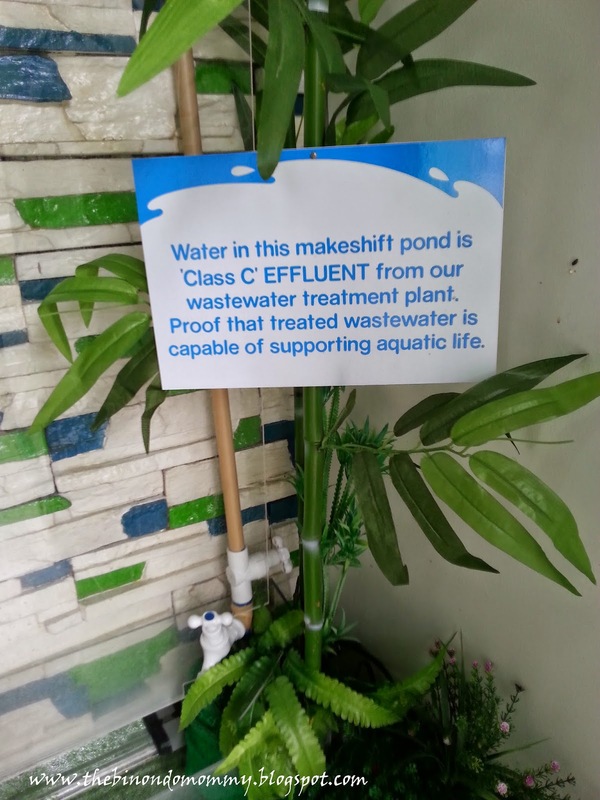 Any experience with Manila Water that you would want to share? Or maybe you want to share how you are doing your part in preserving our water in your own household? I'm open to hear your comments and ideas too. 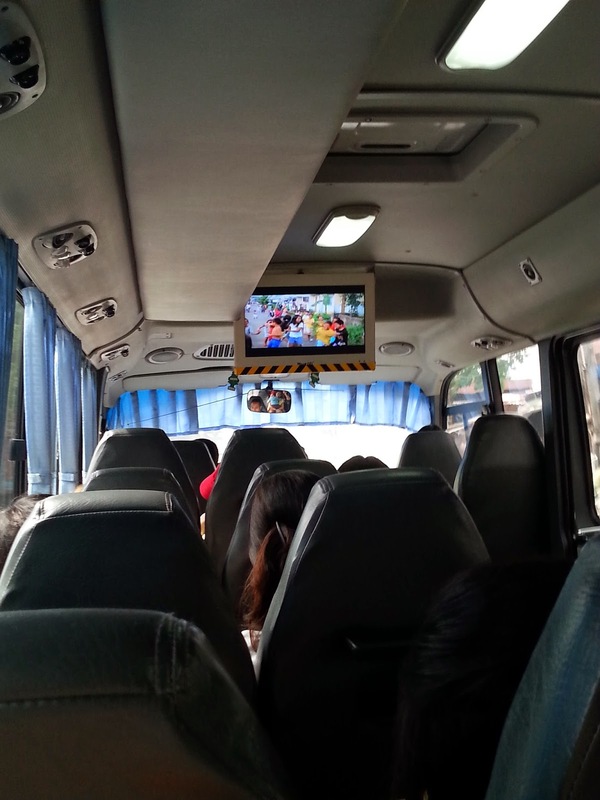 Nakaka-miss ngang mag field trip, I can relive it through my kids who are in school. It's good that you were able to do that with fellow moms.